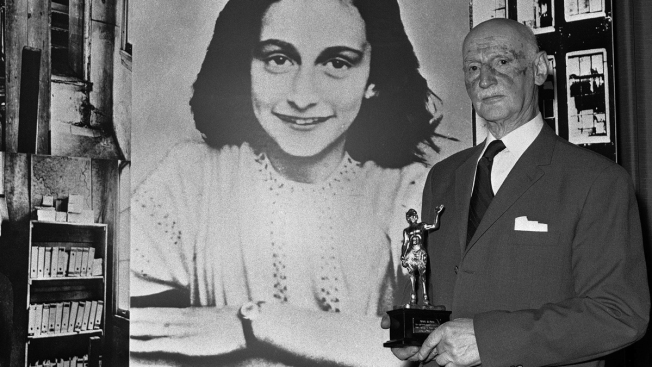 In this Monday, June 14, 1971 photo Dr. Otto Frank holds the Golden Pan award, given for the sale of one million copies of the famous paperback 'The Diary of Anne Frank' in London, Great Britain. New research suggests that the family of Anne Frank, the world-famous Jewish diarist who died in the Holocaust, attempted to immigrate to the United States and later also to Cuba, but their efforts were tragically thwarted by America’s restrictive immigration policy, cumbersome bureaucracy and the outbreak of World War II. Only Otto Frank survived the holocaust. Research suggests the family of Anne Frank, the world famous Jewish diarist who died in the Holocaust, attempted to immigrate to the United States and later also to Cuba, but their efforts were thwarted by America's restrictive immigration policy and the outbreak of World War II.